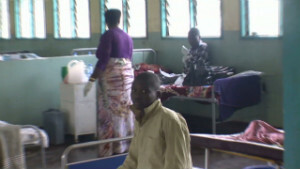 (CNN) -- The Ebola virus has killed 10 people in the Democratic Republic of Congo, the World Health Organization said Tuesday. As of Monday, WHO said, the deaths are among 13 probable and two confirmed Ebola cases reported in Orientale province in eastern Congo. The Congolese Ministry of Health has set up a task force to deal with the outbreak and is working with WHO, UNICEF, Doctors Without Borders and the Centers for Disease Control and Prevention. Twelve cases and eight deaths occurred in the area of Isiro, a town in Congo's north, WHO said. The fatalities included three health care workers. One death each occurred in Congo's Pawa and Dungu regions. Congo's Orientale province borders western Uganda, where 24 probable and confirmed cases, including 16 deaths, have been reported since the beginning of July. 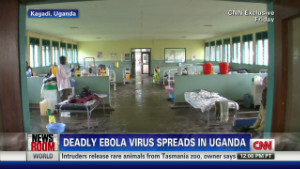 But WHO spokesman Gregory Hartl told CNN that there's no connection between the outbreaks in Uganda and Congo. And, Hartl said, it is extremely difficult to travel between Isiro, for example, and Kiballe, the western Ugandan district where an outbreak emerged last month. That's because it is heavily forested with impassable roads, and the only viable way to travel is going 10 to 15 kilometers per hour via motorbike. So it is unlikely there would be contact between Ugandans and Congolese that would lead to infection. The natural habitat of the Ebola virus is in the central African forest belt region, Hartl said. It's "either by chance" or from "more surveying" for the disease, he said, that "we see these two outbreaks concurrently." Health agencies have embarked on an aggressive approach in Uganda to deal with the cases. WHO has asked countries bordering Uganda to "enhance surveillance" for the virus. The last confirmed case in Uganda was admitted to an isolation facility on August 4, WHO said. The virus was first detected in 1976 in Congo, when the country was known as Zaire. Symptoms can include fever, vomiting, diarrhea, abdominal pain, headache, a measles-like rash, red eyes and, at times, bleeding from body openings.